It is not hard to see why this series is so popular with readers. It has playful language, tongue-in-cheek humour with lots of smelly bits that readers will giggle over. Merek is half boy, half dragon. In fact he is a bit of a shape shifter and sometimes that is good for him but sometimes it puts him in danger especially if anyone finds out what he can do. Merek is back for another adventure with his good friend Brin/Breena along for the ride. A great story to show how misunderstandings can have consequences but all done with humour. When Merek and Brin try to save Lord Crumble’s treasure from a Barbarian attack, they find out more than they expected …about ‘evil’ Barbarians as well as about Lord Crumble himself. But not before getting themselves strung up by their feet and hung from a tree! Donovan Bixley’s black and white illustrations are full of character. It always amazes me how illustrators can capture the feelings and personalities of the characters authors write about. Together, author and illustrator here have created magic. 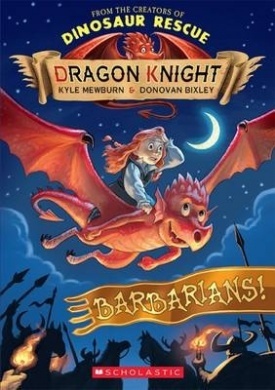 Readers gain so much from having a series of books like Dragon Knight. The language becomes familiar, they begin to love the characters and feel a connection with them. They feel safe reading, knowing they will get all the way through a book without too much effort. I often worry about people wanting to always push readers up to the next level. Pushing is good, but so is letting children read a series without the pressure of having to stop and try the next level. Mileage reading, is what we call it and it is the best way to encourage a love of reading. Series such as this are ideal for encouraging that love for reading. Great for readers in the 7- through 10 age group.